Matt is the Director of Turtle Dance Music, LLC. He is also a music teacher at Adults and Children With Learning Disabilities in Bayshore, NY. He has worked as a teacher, musician and Autism Intervention Specialist. Matt received his graduate degree in Developmental Models of Autism Intervention and Early Childhood Development at Montclair State University. He received his Bachelor’s of Fine Arts in Drama from NYU’s Tisch School of the Arts. He received his Master’s of Arts in Theatre Studies and Theater For Young Audiences from Montclair State University. He loves performing in schools, libraries, regional theaters, and autism centers. He also loves his best friend, Maggie, and his dog, Libby. Matt is also the co-author of Scrak’s Big Adventure! He co-wrote with his brother Tim who is an Autism Advocate. Our mission at AutismFriendlyShows.Com is to help promote the development and growth of all audience members including children and teens with a developmental disability. We promote autism awareness, inclusivity, and neurodiversity. 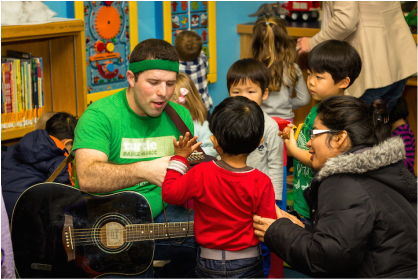 We use music, theater, and the arts as a medium to promote a love of learning and including everyone. We want to make sure that your students, staff, and family love our highly engaging performances. We aim to deliver the highest quality performances that your family, school, and staff will talk about for a long time following the performances. At AutismFriendlyShows.com your family grows when they experience our shows.